“Our IVF boys celebrating their 2nd Christmas together today with an extra addition! Could not be more thankful to Bourn Hall Colchester as without them our little men would not be here,” writes Vicki Woods on our Facebook page. The three friends, who all worked together at the Halifax bank, helped each other through the ups and downs of IVF treatment. 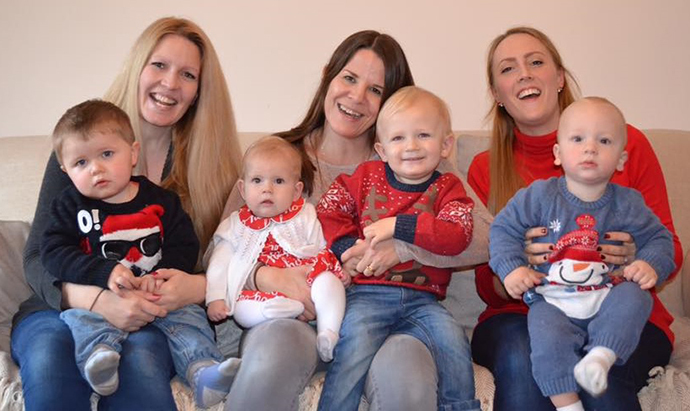 They shared their stories last year in the Essex media to help others struggling with infertility, who might be feeling down as they faced another Christmas. At one point all three women worked in the same Halifax branch – Vicki and Carly as Managers and Nikki as a Mortgage Advisor – and discovered that coincidentally they were each having problems conceiving. 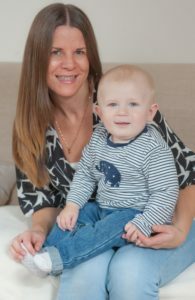 They all ended up having treatment at Bourn Hall Clinic in Colchester and were able to provide an invaluable support network for each other during their journeys through IVF. Carly and her husband Liam weren’t sure if they could continue, “We weren’t sure if we could cope again with the emotional journey and all the medication involved, so we took some time to reflect and consider our other options. After three years of trying the couple had fertility tests and were then finally referred for IVF. Vicki was distraught when she didn’t become pregnant after her first treatment: “My world collapsed, I was devastated,” says Vicki, “but I wanted to carry on trying and take all the chances I had.”However the night before she was due to take her pregnancy test after the second cycle she didn’t feel well: “Mark was out and I sat on the sofa in front of the TV with stomach cramps and watched ‘One Born Every Minute’ followed by a programme on adoption,” she recalls. “I was so convinced that I wasn’t going to be pregnant that I just sat there sobbing.” But then the following morning the test was positive and she could hardly believe it. Unlike Vicki, her friend Nikki Mazurek thought she would never have a baby of her own as she has Crohn’s Disease and had extensive abdominal surgery in the past. 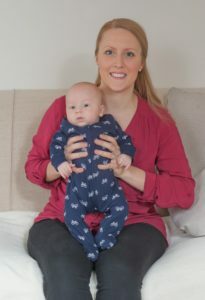 When she met her partner Sam they both wanted children so they went to their GP for advice.Nikki remembers: “Our GP mentioned that NHS funding was being cut in our area shortly which definitely confirmed for us that now was the time to start treatment.” After extensive fertility tests they were referred for IVF treatment. “For our second attempt I wanted to do everything I could to make it work so I had acupuncture and reflexology to help me relax, I stopped eating gluten and took a vitamin supplement. The three friends met up again this Christmas to celebrate together. Plus they have a little extra this year – as after another all her struggles Vicki conceived naturally and now has a little angel, Evelyn. Find out more about IVF treatment at Bourn Hall here.